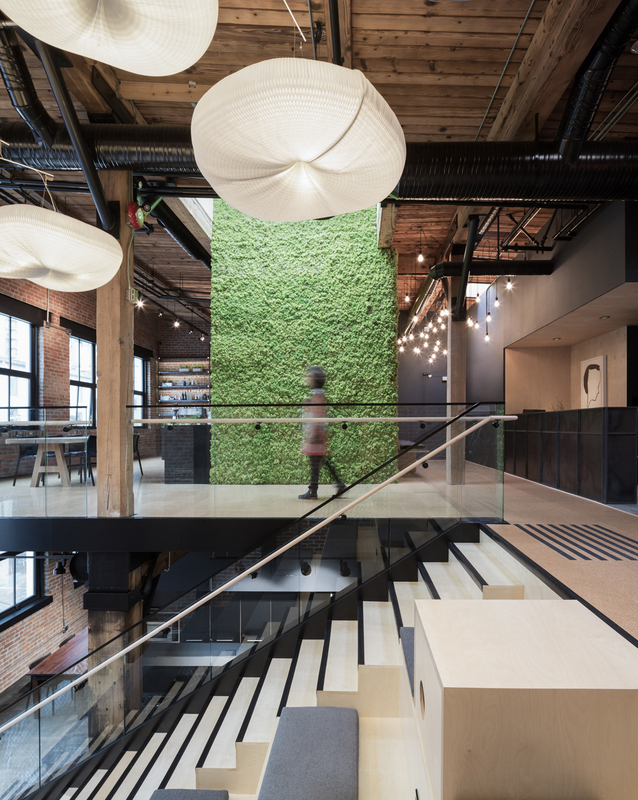 Award-winning communications-based software company Slack located its multi-level headquarters in Vancouver’s Yaletown heritage district. The Slack Headquarters re-imagines an industrial space into an interconnected multi-level open plan office, with modern detail and everyday, utilitarian materials. The new offices retain the heritage character of the building by exposing the masonry walls, heavy timber post and beam structure, and mechanical infrastructure as design elements. The second level of the Slack offices opens through an atrium seating area and stairwell that connects the main level with a small lounge overlooking Hamilton Street. Balancing the industrial atmosphere of a tech-company headquarters, the offices retain warmth with an eclectic mix of locally sourced furniture and artwork, and abstracted natural elements. The concept of an ‘interior nature’ is explored with the mossy wall, located at the heart of the headquarters. Overhanging this space is sculptural pendant lighting by local creative firm, Molo Design. The organic shapes, suspended in the high space between upper and lower levels like floating clouds or tree mushrooms, connect working and social space.